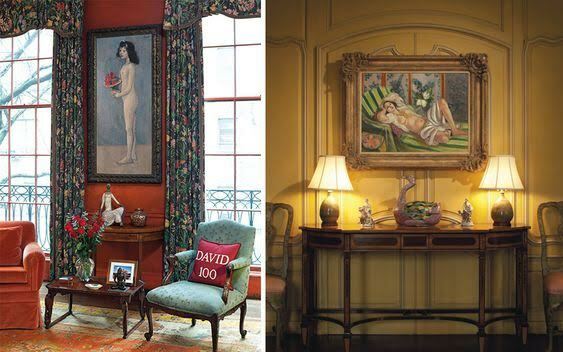 As art doyenne Agnes Gund told Vanity Fair: “David and Peggy’s houses were always . . . very warm and homey” and that comes through in the residential images from Christie’s photographs. You can get a better sense of David & Peggy Rockefeller’s point of view and lifestyle in this fascinating video narrated by their son. What impressed me was how he discusses his parents’ love of beauty, whether formal art or in nature (the couple was deeply involved in philanthropy, of course, including many conservation causes). I’m kind of OBSESSED with their art. I want to say “who wouldn’t be? !” but lately I feel like I’m the only one who likes representational, pretty paintings. As a friend with a great eye said to me, the zeitgeist is now towards art that is “challenging,” which makes you confront certain subjects (like dead animals floating in formaldehyde a la the Saatchi collection - remember the controversy at the Brooklyn Museum with Mayor Guiliani a few years ago??). The collection also has some beautiful works by Picasso, Ingres, endless sets of porcelain, furniture and antique accessories, you name it. AND lots of Asian art - hence the show is going to go to Beijing and Shanghai this April. The NYC auction date is still TBD, but expected to be announced soon. I’ll keep you posted! I myself am an armchair collector, with my major inve$tment being the auction catalogs which are AMAZING. Mine from the Jackie O. auction is completely dog-eared (& btw, highly collectible now that it’s out of print! ).